Coffee contains several compounds which are known to affect human body chemistry. For instance caffeine, which acts as a stimulant. The word caffeine is also called guaranine when found in guarana, mateine when found in mate, and theine when found in tea; all these names are considered chemical synonyms for the same chemical compound. Caffeine is a central nervous system and metabolic stimulant and is used both recreationally and medically to reduce physical fatigue and restore mental alertness when unusual weakness or drowsiness occurs. Caffeine stimulates the central nervous system first at the higher levels, resulting in increased alertness and wakefulness, faster and clearer flow of thought, increased focus, and better general body coordination, and later at the spinal cord level at higher doses. Once inside the body, it has a complex chemistry, and acts through several mechanisms, too complicated for this short text. Caffeine is an ergogenic: increasing the capacity for mental or physical labor. While relatively safe for humans, caffeine is considerably more toxic to some other animals such as dogs, horses and parrots due to a much poorer ability to metabolize this compound. 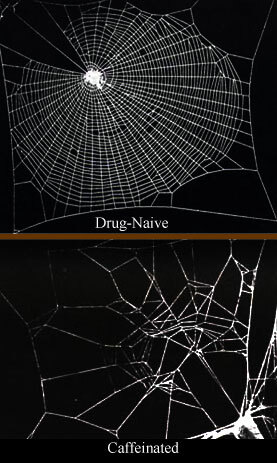 Caffeine has a much more significant effect on spiders, for example, than most other drugs do. Antioxidant, which is an anticancer (the working component is the compound methylpyridinium). Methylpyridinium is not present in raw coffee beans but is formed during the roasting process from trigonelline, which is common in raw coffee beans. In large amounts, and especially over extended periods of time, caffeine can lead to a condition known as “caffeinism.” Caffeinism usually combines “caffeine dependency” with a wide range of unpleasant physical and mental conditions including nervousness, irritability, anxiety, tremulousness, muscle twitching (hyperreflexia), insomnia, headaches, respiratory alkalosis and heart palpitations. Furthermore, because caffeine increases the production of stomach acid, high usage over time can lead to peptic ulcers, erosive esophagitis, and gastroesophageal reflux disease. The precise amount of caffeine necessary to produce effects varies from person to person depending on body size and degree of tolerance to caffeine. It takes less than an hour for caffeine to begin affecting the body and a mild dose wears off in three to four hours. Consumption of caffeine does not eliminate the need for sleep: it only temporarily reduces the sensation of being tired. While consumed with reason, coffee is relatively healthy and gives you just that little boost (in the morning). Reason enough to drink just another ‘cuppa’.